…. you already have my Dragon-maker’s Handbook and/or you already know more than you ever cared to know about my paper mache techniques. I just finished revising my Dragon-maker’s Handbook and some of you will probably get a notice from Amazon. I want those of you who follow my blog to know what this is all about so that you don’t think you are missing something. I have to say that I was always a little embarrassed by the lack of sophistication of my Handbook. I made it shortly after I posted my first, dragon-making video on YouTube. I was inundated with requests for more information. So I quickly put that Handbook together to augment the video. I’ve wanted to revise and update it for years. I finally did. I’m much happier with this one. It is more complete. The photos are much better. 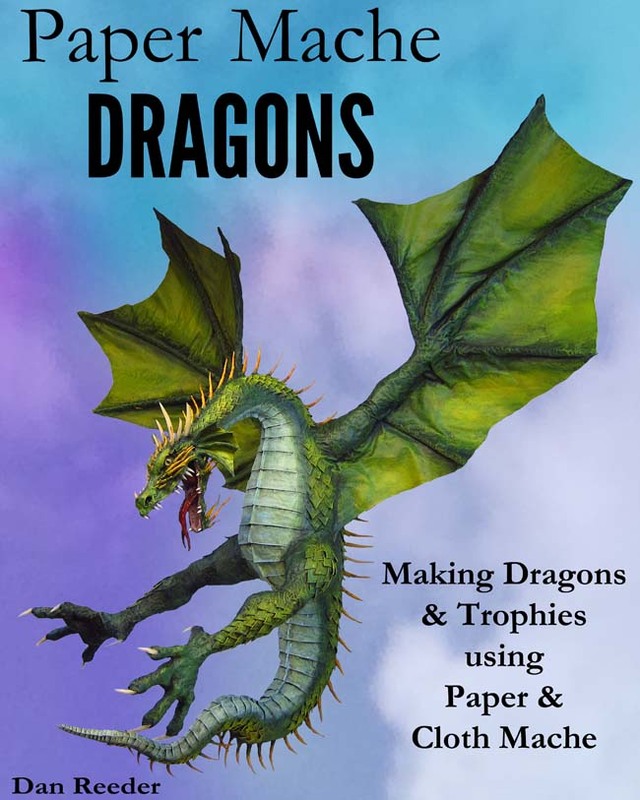 I added a chapter on trophies since those are so much fun to make. Everything about it is better than the Handbook. Still, it is a revision of the Handbook. Of course you don’t need any of my books to understand what I do. Just look at my videos and blog posts. Then again….you may have an “artistic” niece or nephew. Christmas is coming…. If you want a great gift…. then follow this link to my website. 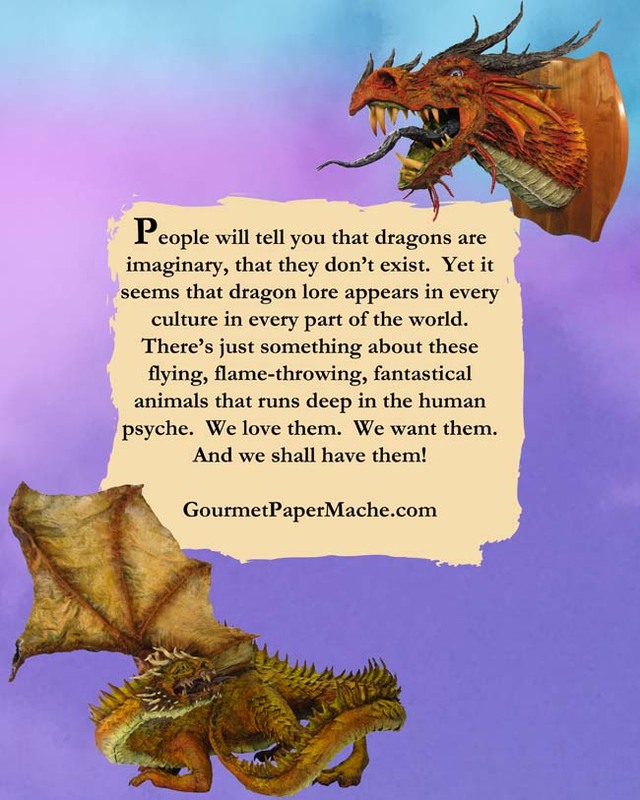 This entry was posted in Uncategorized and tagged dragons, fantasy, Game of Thrones, I love Daenerys, paper mache, paper mache instructions, paper mache recipes, papier mache. Bookmark the permalink. 22 Responses to Don’t buy this Paper Mache book if…. Just ordered it. Really looking forward to it! If it’s half as amusing as the others books, it will be definetly worth it! Thanks Nacho! Yes, I saw your order. I hope you like it. The heck with nieces and nephews! Both books are going on MY Christmas list …IF I can wait that long!! William’s Treasure will be a great book to share with my granddaughter who, like me, loves dragons! Hey Debi. You are too sweet. I made those comments because I didn’t want people to think this was something completely different. I’m just really happy to have it updated. I hope you are well and making art. PS i wil order your other book, i love your creations!!! Hey Laura. That is really great work! I’ve seen her stuff before, but hadn’t seen the videos. Thanks for sharing. And you don’t need the book. Truly. You already know what I offer. But you are sweet. Cool! Must get a copy. Of course you are right Stella. Still, you are master. I need two copies of this one. I have a nephew in one town and a granddaughter in another city 3 hours away so I know they can’t share one. Do I order one and one or can I get 2 in one order? Thank you. And my little Dragon Fanatics will thank you too. Hi Pamela. Hmmm, I’ve never sold two of the same books in the same order before. Here’s what we could do. If you go here, http://www.gourmetpapermache.com/PaperMacheBooks.html, choose the “two book special. I’ll know that when you order that you want two dragon books instead of one of each like it says on the button. And I’ll reimburse $.45 on Paypal so that you will be paying the same as if you bought the two dragon books. Or, you could order the dragon book twice, and I’m reimburse you for the shipping for one of them. Either way. Sorry it’s so convoluted. I should set this up a little differently. Oh, and please tell me on the order what names I should use when signing. Thank you! Thank you! I ordered your two book special (both dragon books please) and they will be going to Alberta Canada. One needs to be autographed to ‘Jay’ and the other to ‘Paige’. Pay Pal didn’t offer the ‘note to seller’ spot for some reason so I thought here would work too. Besides the kids, I’m a huge fan of your work. Hi again Pamela. Thanks for buying the books. I saw the order. Please ignore the email. I sent it before I saw this note. I’ll sign them as you say. And thank you for your kind words. Hey Dan! Wished I had found your blog, videos, or books a couple of years ago when I was working on a project for a small independent film here in Phoenix. It would have saved me a lot of time and work. Granted what I was working on was only 12″ tall, it still took me 6 months to figure everything out. The VFX supervisor wanted a model of a fantasy steam horse to be used in a fore-shortened shot. I had done some paper mache years ago for another prop so this method seemed like it would work. I basically used the same method you do, but added a skin of Spackle over the cloth mache to smooth out the surface as it needed to look like metal when finished. Here is the tutorial I wrote for a friend’s blog on the making of the Mantecoza Steam Horse. See Part II for the finished project. BTW, I am not a professional prop maker. I guess that should have been “forced perspective” shot. Hey, what do I know? Hello Diane. It’s nice to meet you. Wow, your Steam Horse is fantastic! I can see why it took so long. Excellent detail. You made it look exactly like metal. What fun! You didn’t need my books or videos. You know what you are doing. Thank you for sharing your project with me. Good luck on your future projects! Thanks! I really just faked my way along. Even though the film will probably never be finished the steam horse has taken on a life of its own. It has been displayed at many steam-punk events here in the greater Phoenix area and is now scheduled to be on display at The Phoenix Sky Harbor International airport exhibit starting this week. I actually haven’t seen it for a couple of years because it seems to get around more than I do. I still am going to get your dragon book because I would like to see what I can do with those. Thanks again! Since I am located way to your left …. no, the other left, I had to place an order from Amazon UK, I haven’t told my kids anything about it since this is my precious gift to me for Xmas!!!!!! Hi John. You are too funny! It’s fun to sneak presents to yourself (unless it’s gin). Happy holidays!